Product information "GoldScreenPen - Electronic gold tester"
If you need indestructive and deeply pervading authenticity tests of precious metal like gold, silver, platinum or palladium, as well as quick and simple tests for old gold, dental gold, jewellery, ingots and coins of every kind, the Goldanalytix GoldScreenPen precious metal analyser is the right choice for you. The GoldScreenPen (precious) metal testing device is the tool of choice when working in old metal exploitation, for pawnbrokers, refineries, coin traders and recycling companies. Get information about material structure through the conductance of an object in real time. The highly developped, easily transportable GoldScreenPen offers every function needed for a quick and safe test of precious metals. Measurement of every kind of object - ingots, coins, old gold, etc. Related links to "GoldScreenPen - Electronic gold tester"
Instruction manual for Goldanalytix GoldScreenPen - Electronic gold tester as PDF file. 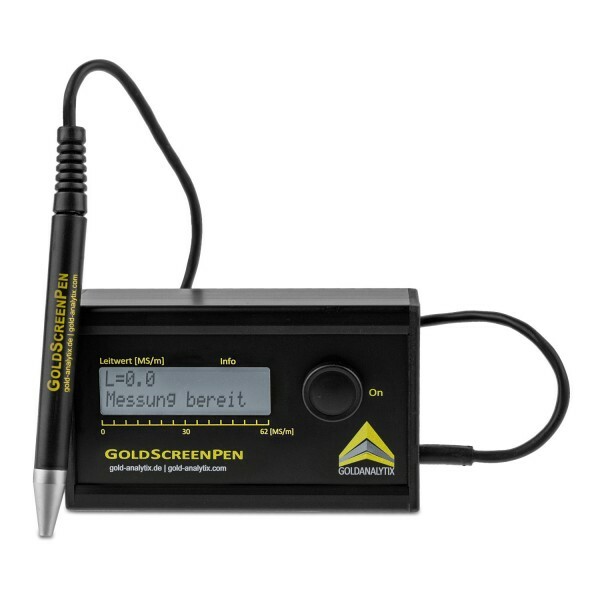 Customer evaluation for "GoldScreenPen - Electronic gold tester"
Ich war schon seit längerem auf der Suche nach einem solchen Gerät. Nach ausführlicher Beratung habe ich mich dazu entschieden, dem Goldscreen pen eine Chance zu geben. Und ich muss sagen, ich wurde nicht enttäuscht. Die Handhabung ist wirklich einfach und habe bis zum jetzigen Zeitpunkt sowohl echtes Gold als auch falsches getestet. Alle Fälschungen wurden auf Anhieb sofort erkannt. Der Preis scheint auf den ersten Blick etwas hoch, ist jedoch in Bezug auf die Qualität des Produktes durchaus angemessen. Wenn man häufiger mit der Echtheit von Gold konfrontiert wird, lohnt sich dieses Gerät auf alle Fälle.